Bulgaria has a rich cultural heritage and a strongly developing economy where specialists in Bulgarian are needed. This programme provides the opportunity to gain excellent language skills and a profound knowledge of Bulgaria's literature, history and culture – combined with an in-depth understanding of the region of Central and Eastern Europe. You will gain a thorough grounding in the Bulgarian language and culture, supplemented by a choice of optional cultural, historical, and social science modules. You will spend your third year abroad. 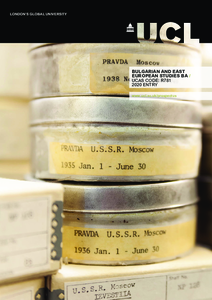 The UCL School of Slavonic & Eastern European Studies (SSEES) is the largest national centre in the UK for the study of Central, Eastern and South-East Europe and Russia. The SSEES Library contains over 400,000 books, journals and film resources. You will benefit from frequent visits and lectures by prominent political, artistic and academic figures—prime ministers, foreign ministers, professors and writers. You will be able to make the most of the huge benefits of studying in London, a global city with sizeable east European communities. This city hosts a wide range of cultural events with an east European dimension. Your degree will train you to the highest level of proficiency in speaking, writing and understanding in your chosen language(s), whether you begin with no prior knowledge or already have a good command of the language. As you progress through the degree, compulsory language modules are tailored to your existing knowledge. You will also take compulsory modules on literature and culture. Your third year is spent abroad. This will not only bring the language and culture you are studying to life, but also strengthen your resourcefulness and self-reliance. You will normally spend this year studying at a university in your chosen country, but alternatives, such as work placements, may be possible. You will select modules to the value of 2.0 credits from a wide range of options. You will spend your third year abroad and take modules at a partner university. We have dedicated resources for language teaching, including technological support through computer-aided language learning facilities, video and DVD materials, and the Internet. The methods we will use to teach and assess you are varied, to ensure that they are best suited to the knowledge and skills being imparted or measured. Assessment will include written, oral and aural examinations, presentations, extended essays and a a dissertation. The programme is designed to equip you with language fluency, cultural competence, historical knowledge and social understanding. Your ability to consider issues from an international perspective will be greatly enhanced and you will learn how to conduct research and to communicate effectively both orally and in writing. With developed skills in critical reasoning, independent thinking and application of theoretical concepts you will be strongly placed to find employment in international organisations, particularly careers which cross international boundaries and use languages. Career prospects are likely to include finance, media, diplomacy, education, translation, research, and consultancy. We will be particularly interested in your motivation for choosing this programme. In addition to academic requirements, you should demonstrate an aptitude for and interest in language study, and relate to us how your interest in Eastern Europe was initiated. Literature, history and culture are key elements of the degree, and your interest in and experience of these fields of study are important. If you are successful in obtaining an offer, you will normally be invited to an applicant open day, comprising introductory talks about SSEES and your degree, as well as a tour of UCL. You will also meet with a member of the teaching staff for your chosen degree programme.